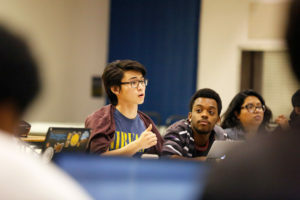 Student Union Assembly (SUA) President Ray Inoue announced he will be resigning from his position at the end of fall quarter. Inoue, who ran unopposed in the spring of 2016, won over 90 percent of the vote with a record high voter turnout of approximately 45 percent. Members of SUA said Inoue’s resignation is the first to occur in the organization’s over thirty-year history. Inoue resigned from the presidency for his own physical and mental health. He will be taking a leave of absence from UC Santa Cruz to spend five weeks in London. When he returns to Santa Cruz in spring quarter he plans to continue his work in the campus expansion student coalition and the student union working group, as well as seeking out new student run spaces to be involved in. The SUA constitution outlines that in the case of the president’s resignation, the vice president of internal affairs (IVP) will take over as president. If they refuse, the vice president of external affairs (EVP) will take over. At Tuesday night’s assembly meeting, both IVP Grace Shefcik and EVP Judith Gutierrez declined the position of presidency. Since neither vice president will take the position, Shefcik will act as interim president while the assembly searches for someone to take over the position. She will therefore be simultaneously acting as SUA president and IVP — Shefcik will be paid for both positions until a new president is hired. The presidency would add an additional $900 monthly on top of her current salary while holding both offices. The SUA constitution does not outline the election process for the president if both the EVP and IVP refuse the presidency but, it does state that for any other SUA position the assembly will host an open election advertising the position with fliers around campus for at least two weeks beginning next week. The SUA is adopting this policy for the presidency position, so the appointment will be open to any currently registered UCSC student. Those running will be interviewed by members of the SUA in week two of winter quarter. Forty-six assembly members will then vote on the next SUA president.